Daily Illuminator: Ogre Miniatures Set 2 Crushed Its Goal! December 1, 2017: Ogre Miniatures Set 2 Crushed Its Goal! It has been quite a busy November for our Ogre fans, with new Ogrezine articles, the Ogre Miniatures Set 1 delivery and release, and, of course, the Ogre Miniatures Set 2 Kickstarter! The campaign closed Monday, raising $87,366, which brings our Many Minis box to a whopping 375 miniatures. That's about 20 cents per miniature - an absolute steal for any miniatures wargamer. 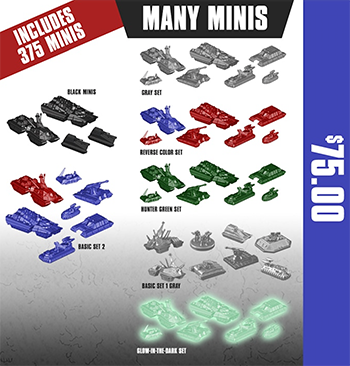 Not only do our backers get an amazing deal on a lot of plastic, they've added value for all Ogre fans, like the Ogre decals and a PDF of transfers usable with any of your Ogre Miniatures. We'll also have full Ogre tournament rules, thanks to this campaign. Now the fun begins, as the production process swings into gear. Fortunately, we had a bit more lead time, given the success of Ogre Miniatures Set 1, so we're farther along in the process than our first campaign, but there's still a lot to do. If you're the impatient sort, make sure you check out the offerings for Ogre Miniatures Set 1! You can find the base set at your local game store soon, and if you're looking to expand your army, the Armory Box (available for preorder now) will be shipping soon. Make sure to follow us on Kickstarter to be alerted when we launch more projects, like a potential Ogre Miniatures Set 3! We're currently focused on getting Set 2 produced, but line editor Drew Metzger has been kicking around ideas for a new set, with info from backers . . . Without the backers, these Ogre projects would not get made, so thank you all for your continued support!